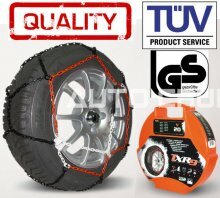 Home :: Car Tyre Care :: Car Tyre 9mm TUV Approved N80 Snow Chains 14,15,16 &17"
Light weight highly robust 9mm steel. Multi coloured to help with identification when fitting. Easy and quicker fitting, without having to jack up your car. Pack includes 4 spare rings. Bright colour plastic heavy duty storage box. Flexible plastic coated inner securing cable which prevents damage to wheels. Chain pattern gives maximum snow grip and traction with minimal brake distance and skidding. Easy to follow picture instructions on how to fit them. N80 949080 Fits Following Tyre Sizes. For other available sizes in our shop see list below.